Numerous industries across the globe have come to trust the quality and craftsmanship behind Mechanix Wear's premium gloves as a staple to their rugged, work wear uniforms. Get a sure, flexible fit with these easy on/off FastFit® gloves. Fashioned from anti-static TrekDry® spandex, wearers are guaranteed lasting comfortable wear that works simultaneously to keep hands cool. 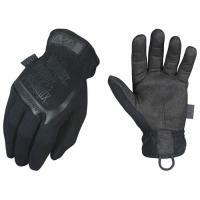 The dual-paneled, synthetic palm eliminates bunching and maximizes dexterity while on the job. An elastic cuff adds to the sleek fit and ease of wear. Secure gloves to your person or gear using the nylon cord loop for convenient carry and storage. The FastFit® gloves meet TAA compliance standards.